Jölkusárlón Ice Beach is one of the special locations that was on my "must" see, must photography, list when I traveled to Iceland this past June. Located along the Southeast coast, the black sand ice beach is adjacent to the Jölkusárlón Ice Lagoon. Ice calving off of glaciers in Vatnajökull National Park enters the lagoon, and slowly over time, moves through the calm waters of the lagoon and then into a small channel that leads out to the ocean. Ocean waves batter and polish the ice before depositing the chunks up onto the black sand beach. In the image below, large chunks of ice in various hues of blue-green and destined for the ocean, drift ever so slowly towards the ocean. This scene is so surreal and calm with only imperceptible movements in the ice broken periodically by the sounds of a large block shifting in the water. 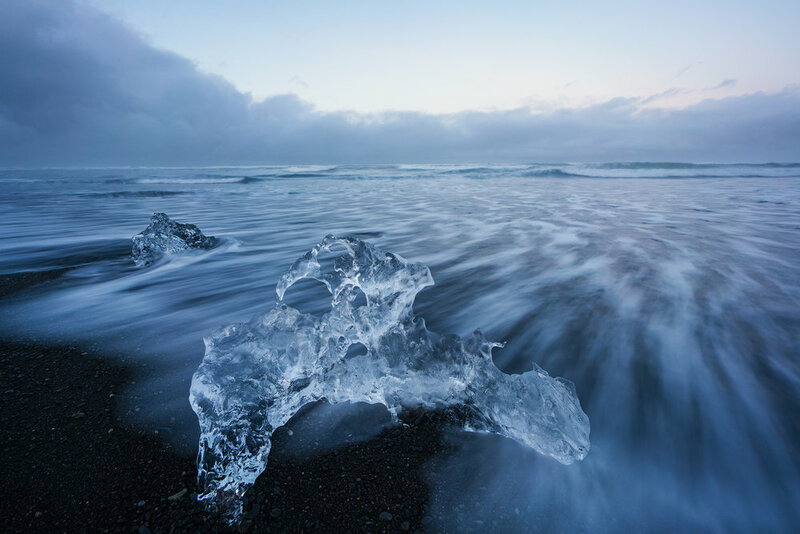 Sculpted Ice, Jölkusárlón Ice Beach, | Sony a7RII and a Voigtlander 15mm f4.5 Heliar III | Image Exposed at ISO 100 at f11 for 1 Second. Capturing the ice and the flow of the water is a matter of simple timing. This is of course assuming that you are interested in imparting a sense of motion and contrast in your image. You can capture the flows as the water moves in from the ocean or as it is leaving the beach. The easiest method is to wait for the flow to move in under the ice and trip the shutter just as it is beginning to recede. It pays to spend some time just watching the oceans cycles as the waves move in and out. It is random and depending on the tides the waves may go through several cycles before a big one slides in under a piece of ice. Not every take will be successful and I spent some time working with a single, interesting piece of ice, to achieve the long flowing lines of water along with counter-flows that circled around the ice. As I was visiting in late June, essentially summer time, there was not a lot of ice on the beach and I spent a few moments just taking in the scene before zeroing in on the main subject in these images. For some of the shots, as in the black and white image, above, I captured the water flow stopping just short of the ice. These images were more serendipitous than planned as I never quite knew where the flows would end. 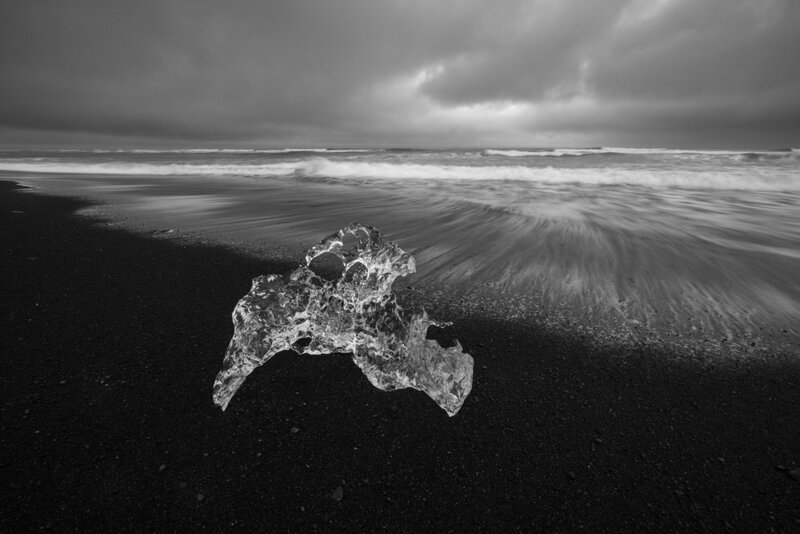 However, the split framing provided contrast between the black sand beach and the glistening ice while still achieving a sense of motion. Ice in the Flow No. 2, Jölkusárlón Ice Beach, | Sony a7RII and a Voigtlander 15mm f4.5 Heliar III | Image Exposed at ISO 100 at f11 for 2 Seconds. The image above is indicative of the long threads of water as it recedes back into the ocean. Part of the timing is waiting for the ocean to actually move under the ice and care must be taken to pay attention to the relative strength of the flow as it can come in quickly, and with a great deal of force, which can swamp you and your equipment. Over time you can look at the ocean swells and know whether the inflow will be large or small. On several occasions I had to quickly pull my tripod and camera out of the surf to prevent a complete soaking. The three images below illustrate the flow of water as it was captured moving in from the ocean. This is literally a hit and miss proposition on when to trip the shutter. But I do like the effect as the water appears almost ghost-like a it merges with the sand. The third image in the series illustrates what can happen when the flow comes in strong. Here it flowed in through the ice and quite literally run up my tripod under the base of the camera. That was a close call. But capturing the amazing amount of motion of the water and the back lighting on the ice was worth the effort. Ice in the Flow No. 3, JJölkusárlón Ice Beach, | Sony a7RII and a Voigtlander 15mm f4.5 Heliar III | Image Exposed at ISO 100 at f11 for 1.5 Second. Ice in the Flow No. 3, Jölkusárlón Ice Beach, | Sony a7RII and a Voigtlander 15mm f4.5 Heliar III | Image Exposed at ISO 100 at f11 for 1 Second. Ice in the Flow No. 4, Jölkusárlón Ice Beach, | Sony a7RII and a Voigtlander 15mm f4.5 Heliar III | Image Exposed at ISO 100 at f11 for 1 Second. In general I was shooting with a shutter speed from 1/2 of a second up to 2 seconds. My camera position was quite low and I worked in pretty tight with the wide-angle Voigtlander lens. I used a circular polarizer to pop some detail on the ice and help manage the exposure time. Because the influx of water can liquefy the sand you must make sure to press your tripod feet into the sand so it will not shift during the exposure. Needless to say a shifting tripod on a longer exposure will leave you with a blurry image.